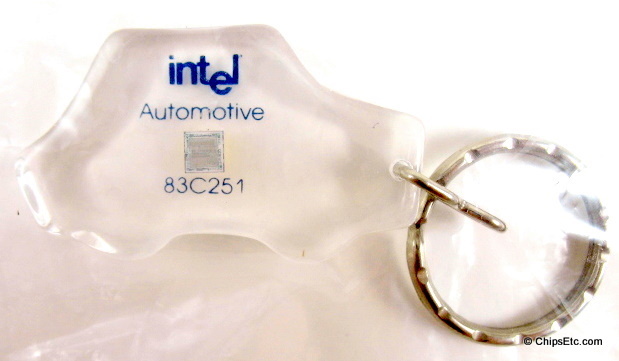 Lucite keychain from Intel featuring and early sample version of one of their D27256 high-density EPROM memory chips. This 256K (32K x 8) UV Erasable EPROM chip came in a 28-lead ceramic DIP package and was assembled & tested in the Philippines. It was manufactured using Intel's advanced HMOS ll-E technology. The Intel 27256 EPROM was compatible with high performance microprocessors like the Intel iAPX 186 and also compatible with Intel's 8051 family of microcontrollers. ​Reads: "Intel 27256: Leading the Way". 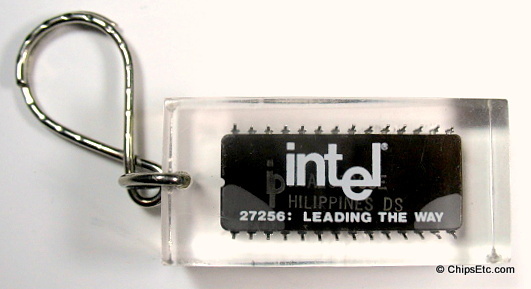 Chip is marked "Philippines DS" & "PGM AT". 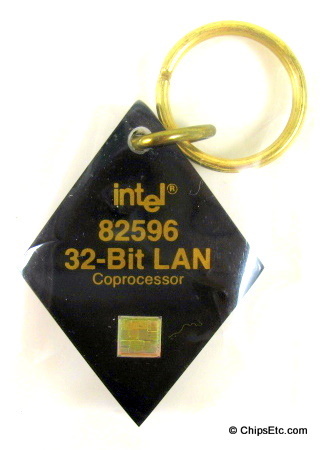 The Intel 82596 LAN (Local Area Network) Co-processor had a serial speed of 10 Mbps using a 32-bit local bus and was a support chip used in networking cards which could be installed in Intel 386 powered IBM compatible PC's. The 82596 Co-processor chip could perform network processing functions independent of the computer's CPU. It was replaced in 1995 by the Intel 82557 Lan Coprocessor that had a serial speed of either 10 Mbps or 100 Mbps using a 32-bit PCI bus. The 83C251 Microcontroller was a member of the MCS-51 Family. Also know as the 83251, it was an 8-Bit Control Oriented Microcontroller. Intel worked with Ford to put these Micro-controller chips into many of it's automobile models as Engine Control Units (ECU) to control engine functions. 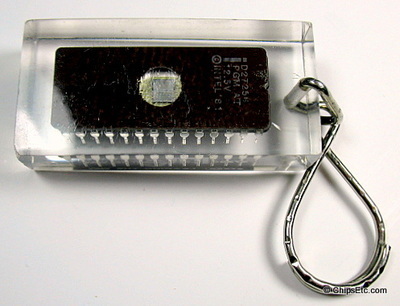 Later "C" versions used CMOS technology and were less power-hungry than their 83251 NMOS predecessors. This made them more suitable for battery-powered devices. The Intel i486 OverDrive processors were a category of various Intel 80486 Processors that were produced with the designated purpose of being used to upgrade 386 versions of personal computers. The OverDrives typically possessed qualities different from 'standard' i486's with the same speed steppings. Those included built-in voltage regulators, different pin-outs, write-back cache instead of write-through cache, built-in heat sinks, and fan-less operation - features that made them more able to work where an ordinary edition of a particular model would not. 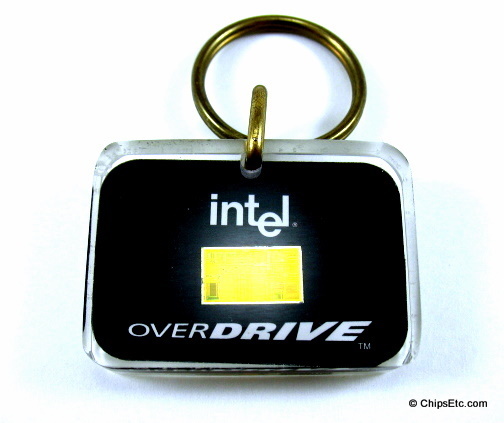 Same i486 OverDrive chip as item above, but this keychain is Rectangular in design. 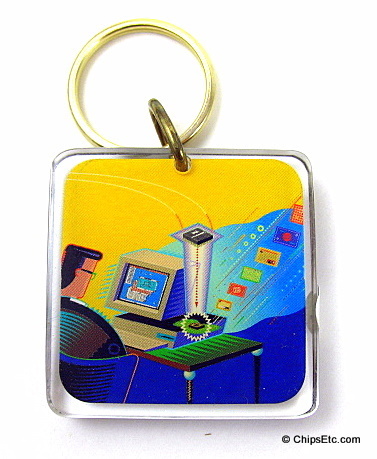 Another type of keychain design featuring an Intel i486 OverDrive processor. 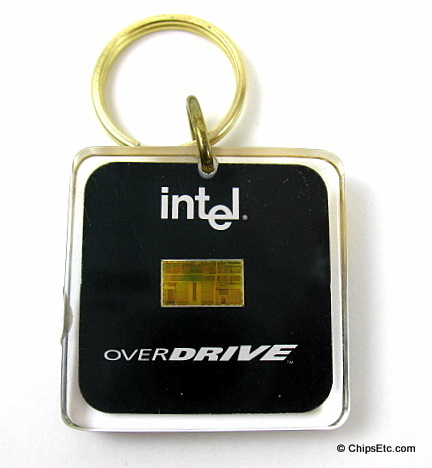 Reads "The Intel OverDrive Processor. Upgradability just checked in". Intel's first version of it's 32-bit Pentium Processor (called the P5) used an 0.8 um Bipolar CMOS manufacturing process and had 3.1 million transistors. 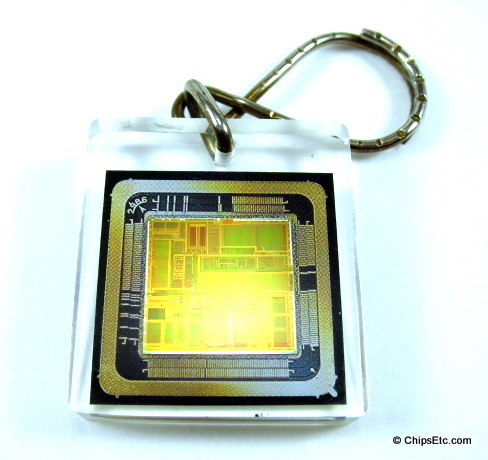 Clear Lucite keychain has the first (P5) version of the Pentium Processor chip encased inside. 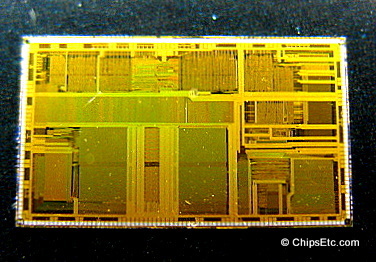 Chip is mounted on a printed graphic background to simulate the substrate package that the chip would typically be bonded to using a die-attach process followed by a gold wire-bonding process to connect the chip electrically to the package.